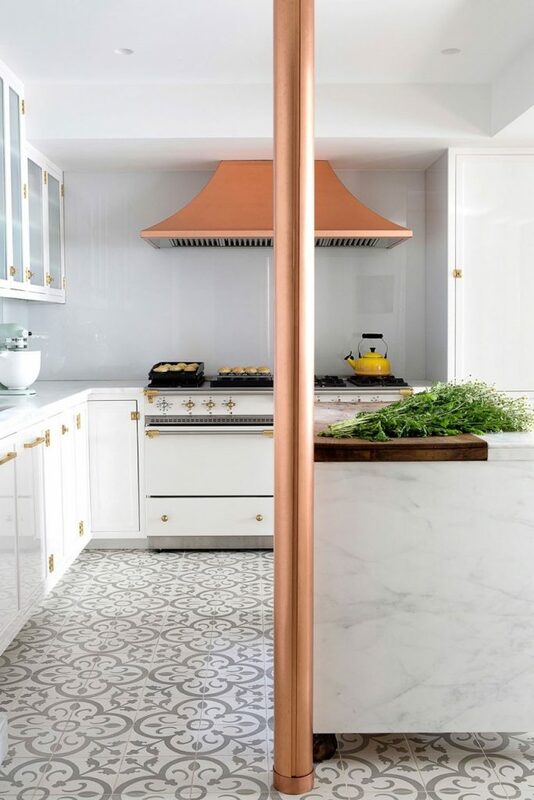 Copper Is The Medal Winner In Today’s Kitchens. 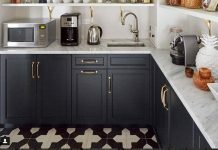 Copper is taking the lead in today’s kitchens. Arguably, stainless steel accessories and appliances ruled the kitchen for many years. It telegraphed the message that the kitchen was a serious place. But, now, warm toned metals are beginning to shine. 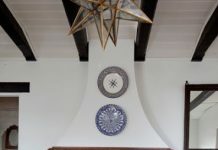 Here’s one example, in a design by Fawn Galli Interiors. The soft gray of Granada Tile’s Normandy cement tile provides the perfect foil. Above, the metallic jewelry seen in the the stove hood, the pipe and the hardware adds a flirtatious feminine touch. Below, who says a kitchen can’t be fun? We love the addition of those soft fur topped bar stools. Oooh la la! Whichever way the trends may lead, Granada cement tiles prove their timeless appeal. With over 40 vibrant colors and 400 eye-catching designs to choose from, they can work in styles from traditional to modern to bohemian. Check out our interactive catalogue or peruse our cement tile shop to see our large selection of in-stock handmade master-crafted cement tiles. And, of course, we’re here to help you make a decision. By the same token, you can call us at 213-788-4238. 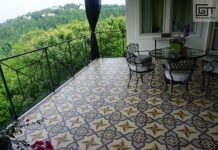 We’d feel happy to help you decide which of our encaustic tile designs would be perfect for your project. We’re sure you’ll fall in love with your new cement tiles before the grout dries.